Share the post "Purslane Or Portulaca Oleracea Is A Tasty And Nutrient-Rich Weed"
What is Purslane (Portulaca oleracea)? Purslane is actually a weed to most gardeners, but is actually more useful than you can ever imagine. This plant is also known as verdolaga, pigweed, little hogweed, red root, pursley, and moss rose. In India, purslane is known as sanhti, punarva, paruppu keerai, “gangabayala kura”, or kulfa. Purslane is an annual succulent in the family Portulacaceae. It has smooth, reddish, mostly prostrate stems and alternate leaves clustered at stem joints and ends. The yellow flowers have five regular parts and open singly at the center of the leaf cluster for only a few hours on sunny mornings. Depending upon rainfall, the flowers appear at any time during the year. Seeds are formed in a tiny pod, which opens when the seeds are mature. Although purslane is considered a weed in the United States, it may be eaten as a leaf vegetable. It’s best picked in June and July. It has a slightly sour and salty taste and is eaten throughout much of Europe, the Middle East, Asia, and Mexico. The stems, leaves and flower buds are all edible. When harvested in the early morning, the leaves have ten times the malic acid content as when harvested in the late afternoon, and thus have a significantly more tangy taste. Purslane may be used fresh as a salad, stir-fried, or cooked as spinach is, and because of its mucilaginous quality it also is suitable for soups and stews. Australian Aborigines use the seeds of purslane to make seedcakes. 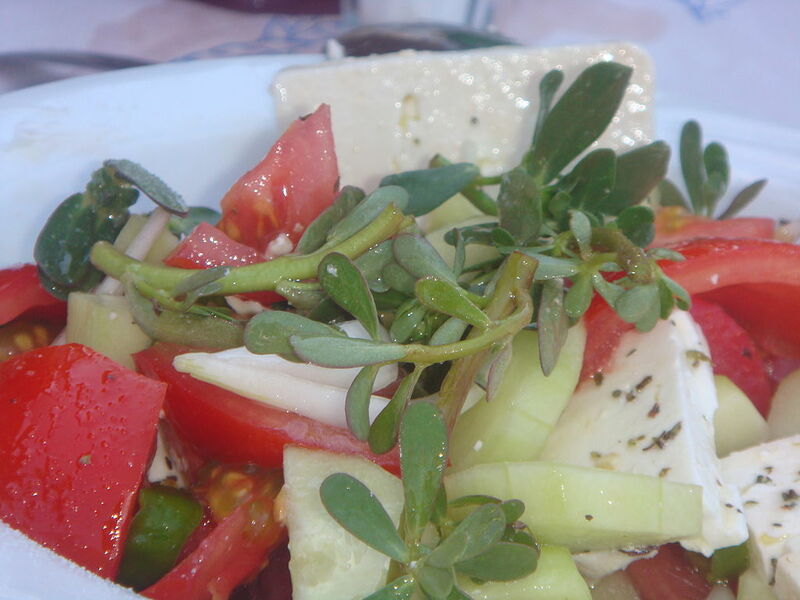 Greeks, who call it andrakla or glystrida, use the leaves and the stems with feta cheese, tomato, onion, garlic, oregano, and olive oil. They add it in salads, boil it, or add it to casseroled chicken. In Turkey, besides being used in salads and in baked pastries, it is cooked as a vegetable similar to spinach. Called Bakleh in Lebanon, Purslane is eaten raw in a famous salad called fattoush, and cooked as a garniture in fatayeh (triangular salted pastries). In Albania, known as burdullak, it also is used as a vegetable similar to spinach, mostly simmered and served in olive oil dressing, or mixed with other ingredients as a filling for dough layers of byrek. In the south of Portugal (Alentejo), baldroegas are used as a soup ingredient. In Pakistan, it is known as qulfa and is cooked as in stews along with lentils, similarly to spinach, or in a mixed green stew. There is evidence of using purslane as a food crop or medicine all the way back to at least the pre-Columbian era in North America. This weed is loaded with essential vitamins and antioxidants, vital for your overall well-being. Purslane is high in vitamins A, B, and C, it contains vitamin E (alpha-tocopherol), vitamin B, carotenoids and dietary minerals such as magnesium, calcium, potassium, and iron. Plant’s most remarkable attribute is the surprising amount of omega-3 fatty acids. Purslane contains more omega-3 fatty acids (alpha-linolenic acid in particular) than any other leafy vegetable plant. Many people take expensive fish oil supplements to cover this important part of our diet and here it is growing in our yard for free! So, just from the vitamins and omega-3’s fatty acids alone, Purslane (Portulaca oleracea) is very good as a boost to the immune and endocrine systems. Specifically, it would be very helpful for those suffering with adrenal exhaustion or thyroid imbalances. It has folkloric use in sore mouths and to ease a toothache. In traditional Chinese medicine pigweed leaves are used for insect or snake bites on the skin, boils, sores, pain from bee stings, bacillary dysentery, diarrhea, hemorrhoids, postpartum bleeding, and intestinal bleeding. But even though this plant has a long history of use though there is a bit of controversy around it. You can find different recommendations to use Portulaca oleracea freely and also suggestions to stay away from it. When there is such a controversy there is often a reason. In purslane case it is because the plant has a high amount of oxalic acid. A little bit of the plant raw is fine, but some sources recommend better to steam or cook purslane to avoid digestive disturbances. 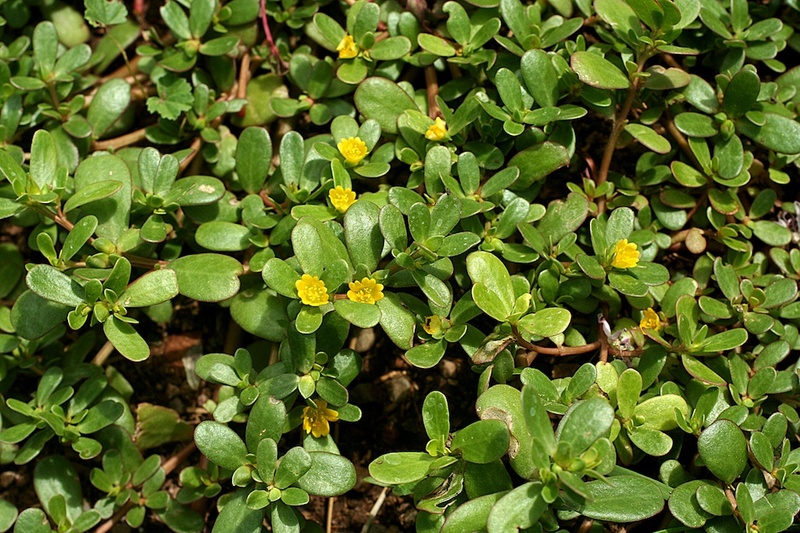 If you do not find purslane growing wild, many companies sell seeds for golden purslane (Portulaca sativa) or garden purslane (Portulaca oleracea). These varieties grow upright rather than horizontal and have larger leaves than wild purslane. Purslane is an annual that thrives in rich soil and prefers recently turned soils. The plant is susceptible to frost, so does not emerge until the soil is quite warm. In most U.S. climates, it can be sown starting in May. Plant the seeds in shallow trenches 4 to 6 inches apart, then cover them lightly with about a quarter inch of soil. Keep the planted seeds moist until all the plants have sprouted. After the plants are about 1 inch tall, they won’t need much attention. Plants will be ready for harvesting in 4 to 6 weeks. • Bring a pot of water to a boil. Add potatoes and boil for 15-20 minutes or until tender. Drain. • Cover the purslane with water in a separate pan and boil for 5-7 minutes or until tender. Drain. • Melt butter over medium heat in your saucepan. Stir in the flour to make a thick paste; slowly whisk in the milk and stir constantly until thick. • Add in the potatoes and purslane and coat with the sauce. Serve immediately. Do you use Purslane (Portulaca oleracea) for cooking? What is your experience with this plant? Please share your recipes and other thoughts with fellow gardeners in the comments below!